The history of .at domains begins as early as in January 1988, when the University of Vienna registered .at with Jon Postel, an American scientist, responsible for delegating top-level domains at the time. What constituted a manageable task initially, because only a small number of computers and their Internet addresses required administration, soon grew into an increasingly complex challenge. Today, nic.at is the central node of the .at zone where everything converges, with more than 1.3 million registered .at domains. The first registrations under the ".at" top-level domain in 1988 were administrated by the University of Vienna. However, the growing number of registrations soon made it necessary to translate this activity into a corporate structure, not as an administrative unit or authority. As a result, in 1998, nic.at Internet Verwaltungs- und Betriebsgesellschaft m.b.H. was established as a result by ISPA (Internet Service Providers Austria) who were proprietors of nic.at until the end of 2000. ISPA as an association, however, soon reached the limits of its capacities. Proper domain administration required more management capacity and more resources than could be responsibly provided on a voluntary basis by an association board. So the ISPA Board realised that a more appropriate ownership structure would be necessary to make nic.at a good provider of services to the Austrian Internet community (also referred to as LIC = local Internet community) in the long term. Consequently, a new structure was chosen, namely the 100% transfer of nic.at Internet Verwaltungs- und Betriebsgesellschaft m.b.H. into the non-profit Internet Foundation Austria (IPA) - corresponding to the structure in many EU countries (e.g. Netherlands, Denmark, and Sweden). A central role is taken by the Domain Name Council which is an advisory body to the Internet Foundation Austria (IPA) that decides upon basic issues of the domain name delegation policy. Besides national and international experts, the Council also includes representatives of Internet users and service providers. This way, all interest groups of the local Internet community can both participate and exercise control. The demand for .at domains has been great from the beginning - at the end of 2000, some 160,000 domain names had already been registered, by 2016 more than 1.3 million. Over time, hand in hand with the related, growing technical and security-relevant requirements, today's four nic.at departments were established: Research & Development, Internet Security Management (ISM), Operations, and IT, which all ensure the maximum internal and external availability of services. The technical operation of the .at-zone has remained with the Vienna University Computer Center (ZID). Domain management requirements have likewise evolved in equal measure. Scopes of duty and responsibility such as registrar service, customer service, billing, and accounting were taken over gradually and further developed by separate nic.at departments. The increasing number of legal inquiries and domain name disputes between the domain holders (e.g. trademark rights) made it necessary to establish an internal legal competence - also with regard to legal disputes that were affecting the registry nic.at itself. The nic.at Legal Department has been quite successful in terms of consultation related to legal disputes. In summer 2000, Richard Wein was appointed CEO, responsible for finance, administration, organisation, and IT. 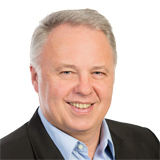 In September 2003, Robert Schischka joined nic.at as a second CEO, primarily responsible for technical operation. From 1998 to 2012, nic.at's full company name was nic.at Internet Verwaltungs- und Betriebsgesellschaft m.b.H. On 19 October 2012, it was officially changed to nic.at GmbH. ipcom GmbH was founded in 2005 and is a 100% daughter of nic.at and offers consulting, services, software, and training in the fields of Voice over IP, Top-Level Domain Registries, and the Domain Name System. IPCom provides vendor-independent services and relies on open protocols and Open Source Software. Its customers include international enterprises in the industrial and services industries, mobile, fixed line and Internet service providers, and domain name registries in Europe and the Middle East.